Peel and de-seed pumpkin, then cut into walnut sized pieces. Boil or steam until soft and tender. Blend into puree and let cool. Beat egg yolks and sugar until light and fluffy. At the same time, warm the cream and spices, then add to cream cheese. Mix well. Add sugar-egg to cream cheese-cream mix. Add pumpkin puree and season with salt to taste. Fill into oven-proof ramequin moulds and set into heat-proof dish. Fill dish with hot water, up to half of the ramequins. 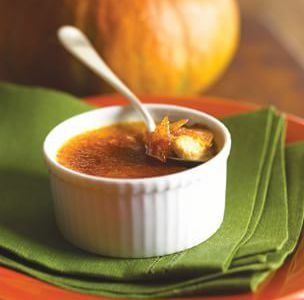 Sprinkle lightly with brown sugar (and a little salt, to balance the sweetness) and caramelise with a Chefs blow torch.